During February Arctic sea ice volume increased by 2075 km3, according to the PIOMAS model, which is well below the 2007-2017 average of 2437 km3. Only 2014 and 2016 managed to score lower, at 1930 and 2047 km3 respectively. This means that 2018 has consolidated its second place in the ranking, creeping somewhat closer to 2017. Especially the gap with 2013 has widened spectacularly from 166 to 1261 km3. Closest follower is now 2011 at 817 km3. Volume increases for December in the last 10 years aren't all that far apart, ranging from 3500 to 4000 km3 (rounded off). This year was on the lower side of that range, with 3547 km3. Only 2010 and 2014 were lower than that, just barely. This means that 2017 ends the year in third spot. The gap with 2012 has been reduced some more, from 733 to 497 km3, and the quickly widening gap with 2016 has stopped widening for now, going from 1482 to 1340 km3. Another late update. Apologies. It must be because winter is a-coming. The October sea ice volume increase of 2592 km3, according to the PIOMAS model, was pretty much run of the mill. However, two years in the past decade do not fit that bill/mill, as they showed very muted growth during October: 2007 (1637 km3) and, of course, last year with 1648 km3 (things would get even crazier during November). 2017 is still fourth lowest on record, but the difference with 2012, 2016 and 2011 has grown and 2017 is now practically on a par with 2010. Just like last month, there haven't been any major changes, and that's good, because it means things haven't gotten worse (according to PIOMAS). But things haven't improved either. After a month of below average volume growth, the difference with number 2 in the rankings (2011), has decreased slightly from 1851 to 1731 km3. On the other hand the difference with 2012, the year when the lowest minimum on record was hit, has increased from 2099 to 2491 km3. Well, November definitely was an Oh Jesus-month. 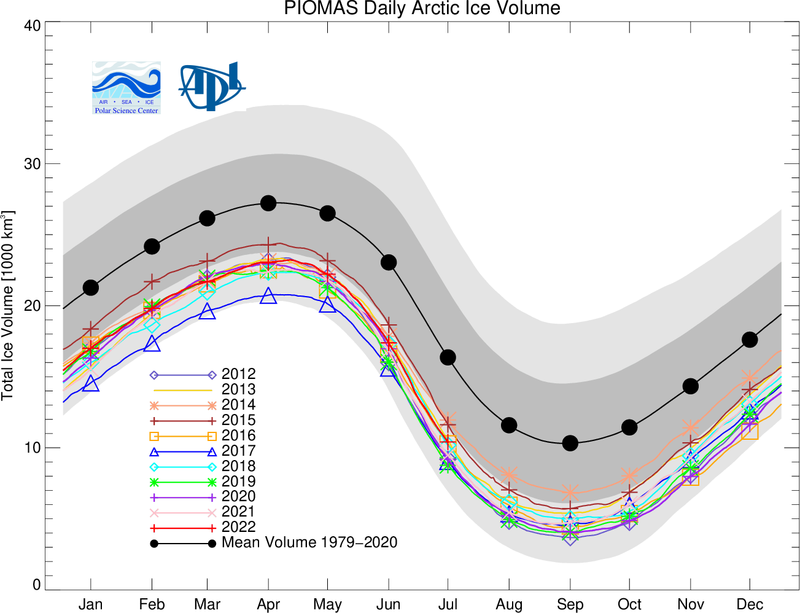 Just like during October, the stall in sea ice extent has been reflected in the PIOMAS sea ice volume numbers. The Arctic amassed just 2904 km3 of sea ice, as compared to 3721 km3 for 2012 and 4054 km3 for 2011. The last time a November clocked in less than 3000 km3 was in 2006 (2567 km3), but right now 2016 is more than 4000 km3 lower than 2006, which means there should have been so much more opportunity for expansion. It's just crazy. Sea ice physicists from the Alfred Wegener Institute, Helmholtz Centre for Polar and Marine Research (AWI), are anticipating that the sea ice cover in the Arctic Ocean this summer may shrink to the record low of 2012. The scientists made this projection after evaluating current satellite data about the thickness of the ice cover. The data show that the Arctic sea ice was already extraordinarily thin in the summer of 2015. Comparably little new ice formed during the past winter. Today Dr Marcel Nicolaus, expert on sea ice, has presented these findings at a press conference during the annual General Assembly of the European Geosciences Union in Vienna. Read the rest of the press release here, and some good reports on The Carbon Brief, The Arctic Journal, and yes, The Daily Mail. I attended the press conference and was surprised to see such an accurate and actual portrayal of current conditions in the Arctic. Usually these scientific press conferences are about things that are behind us, like the previous melting season or some such. But Dr. Nicolaus jumped right into it, discussing the temperature readings from buoys in the Arctic that showed the North Pole experienced temps above 0 °C at the end of December, after which he discussed the latest CryoSat-2 results.